Packages are arriving and my to-do list is growing with each delivery…First, let’s talk about the dining table and bench. I ordered this Better Homes and Gardens table from Wal-Mart and this matching bench. They are the perfect size and the price can’t be beat (about $200 after tax for both pieces). So far I’ve only put together the bench, but I’m happy with the quality. I don’t love the light wood top, so I’m going to sand and re-stain it. 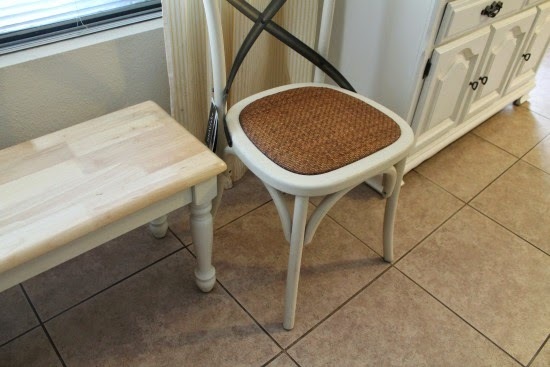 I also ordered a pair of dining chairs to go opposite the bench. 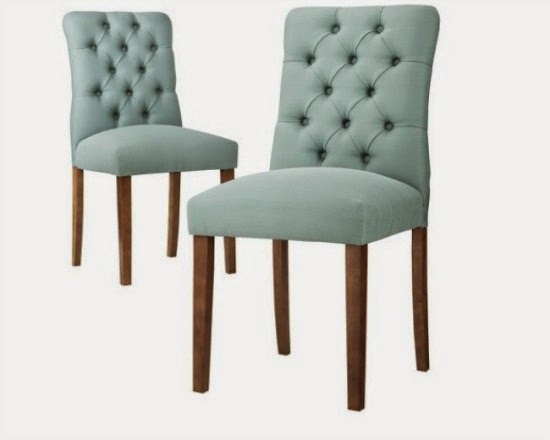 They are the ‘Safavieh Eleanor X Back’ chairs from my mood board and I love them. I got them on sale from Overstock, but they were still more than the table and bench combined. Oh, and I have a quick tip if you plan on ordering from Overstock or Wayfair – make sure you price check both sites and Amazon! When I ordered these chairs, they were $80 more on Wayfair! That’s a big price difference. Amazon was the most expensive in this case, but in the past they’ve been the cheapest (example: my entry bench). Decisions, decisions…It’s hard to tell in the picture below, but they really are all different shades of white. In other news, I ordered a cup holder wall rack from Décor Steals last week. I’m hoping it’ll be here in time, but shipping from there always takes FOR-EV-ER, so we’ll see. I’m also not positive it’ll work in that space. I really need a short and wide rack, but this one is skinny and tall. I’m hoping I can either flip it or make it work some other way. If not, I’ll put it elsewhere and come up with a different idea for decorating the wall. I also received the fabric that I ordered to make the valance/shade for the back door. This was my first time ordering fabric from Zazzle, but I was impressed with their selection and quality. Oh and for full disclosure, I was provided a gift card to buy fabric and create a project. I’m still trying to decide what type of valance/shade I want to sew for the window. 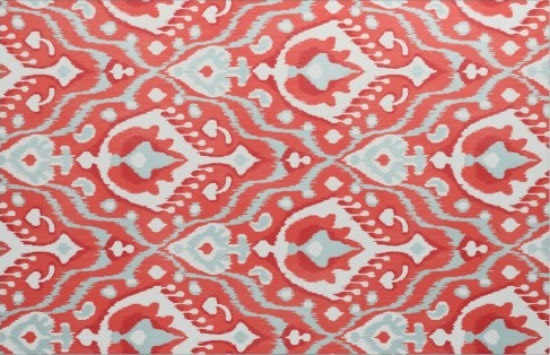 Oh, and I did order a pair of upholstered chairs too, but I didn’t like the color of the fabric once they arrived so I returned them to Target. Oh, and a quick side story: I was at Target a couple days after I returned the chairs and I saw the box of chairs for sale in the furniture department. As I looked for the price (out of curiosity) I noticed a label on the side of the box that had my full name and address on the box. Maybe I’m just paranoid, but I was kind of pissed that my personal information was left on the box and put out for anyone to see. Granted, I should have checked the box before I returned it, but I think Target should have also checked and removed my information. So my PSA for the day: Make sure you double check your box and remove all of the address stickers before returning something to Target. And yes, I did stop and rip the label off myself. Paint table and bench legs? Replace light fixture – maybe? Oh, and don't forget to stop by Calling it Home and check out the other linking participants' progress! I LOVE those chairs. So cute. I say put it all together and then see how much the color bugs you. In the photos, it doesn't look bad at all. That being said, if the table and bench legs are more of a cream color and the chairs are bright white, then I can certainly see why that would be an issue. The chairs look a little tricky to paint with the cane seat and the black cross detail on the back. 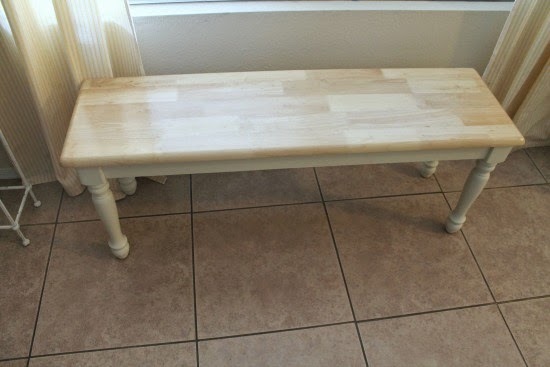 Maybe just paint the bench and table base a true white? I definitely sympathize with your dilemma--I know I would be bugged by the different shades of white, too. My husband always reminds me, though, that I'm the only one who notices these things, so I think even if you do nothing, you'll still be fine. I LOVE those chairs. I wouldn't paint them if it were me, mostly because they look a little tricky. I would go with option 2 or 4. I like the idea of the blue table and bench a lot, especially if you restain the wood tops, that would be gorgeous. Most likely this hasn't been very helpful, but I'm excited to see what you decide to do! I am totally crushing on those chairs! SUCH a fab find! As for the different whites, they might not bother you after all. If it turns out they do, I would definitely paint the table and bench rather than those gorgeous chairs!!! It's still progress my dear! I love the overstock chairs!!!! Yes, paint away so they look like a real set! 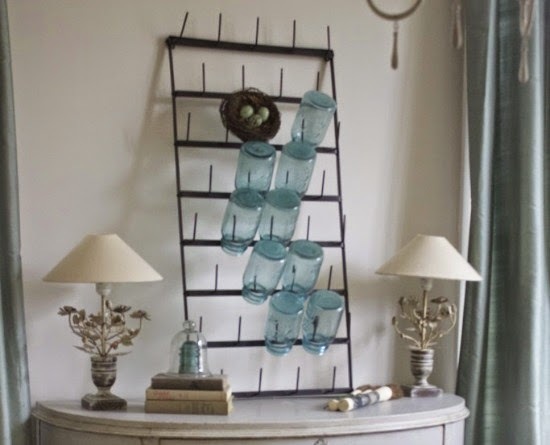 Love that rack, saw it at Kelly's and it's gonna be a great display that you can change around! I love the colors you are working with. And I LOVE the white dining chairs. I might need to sang a few of those up for my dining room! They were marked the price that I paid, which is about $50 less than normal (coupon code), so someone is going to get a good deal! I feel like my home to do list is never ending but a little progress is at least some progress, right?! I love that fabric!! I love the idea of this One Room Challenge! The problem is I can never focus on just one room, I am always changing things up in every room of the house. You've done so much already! I can't wait to see how it all comes together. I love those chairs--they are different than anything I've ever seen before.